Another bragging post of course... A proud mom seeing her youngest son excel in the world of cooking adding many new ideas. Curt is one of those kids (oops men) that loves food. There are no boundaries when taking good quality ingredients and taking it to the next level. Use an age Danish Blue Cheese he said, at least aged 60 days. He said you don't need much. A little on each burger will go a long way, it's a very strong tasting cheese. I love blue cheese so there is no such thing as too much for me! Sprinkle each burger with Worcestershire sauce, salt, pepper and garlic powder. Heat the grill on high for around 10 minutes and set to low. Set seasoned burgers on the grill. Grill on low for around 10 minutes. ( Depending on how you like your burger, less time for medium rare or rare). Flip and continue to cook another 10 minutes and baste with a few more drops of Worcestershire sauce to your desired doneness. Toast buns on the grill at this point. Top each burger with some crumbled Danish blue cheese and crumbled crispy bacon. Close the lid for around 2 minutes allowing for the cheese to melt for creaminess. Place the cooked burger on a buttery toasted bun. Garnish with toppings and condiments of choice, enjoy. 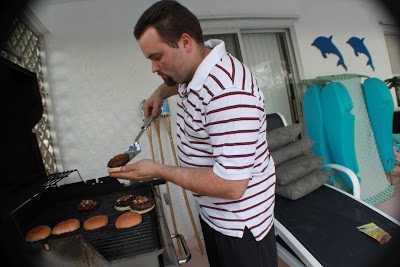 I was planning to grill burgers tonight so this is a very timely post. It looks delicious-I need to see if I have any more blue cheese left! Happy pre birthday,sweet friend! Glad to see you are going on a much needed vacation for a little R&R! Make sure that you make every minute count and I look forward to your return! How cool is it that your son cooked you dinner! Bravo Curt! Happy birthday to you! I hope that the trend of good things that the dinner started continues for you throughout this next year. Happy pre birthday! Great burgers! Sounds like a great flavor combination when grilling burgers this summer. Wow this burger seems awesome! I love blue cheese, great combination here. This is a classic - let that man cook! We have just reached grilling season and am yearning to grill up some of these beauties. he looks like a man enjoying his work and the burgers sound outstanding. I read the links and especially enjoyed the wing ones. to have your son cook for you. It's wonderful that your sons love to cook. You taught them to love good food and I am sure good memories of you and them cooking in the kitchen. That is the best thing that we can pass on to our children, memories. I wish you a wonderful birthday. I am so happy that we met in this world of blogging. I consider you my good friend. I LOVE black and blue burgers!! This looks great. Buzzed!! Mouth-watering! Have a great trip! Happy Birthday! looks delicious. I hope you have a wonderful birthday. Thanks for sharing! oh this burger looks great! awesome job! I'm with you Claudia, it's hard to pass up a good burger. These sound wonderful and so nice that your son made them. Happy early birthday. I hope it's a great one! Sounds like a great burger. And a great son for making you this birthday meal! Ooh, I love a good burger--and blue cheese is always a perfect topping! Omg, this would be a major hit at my place. Looks so moist, juicy and delicious! I love blue cheese burgers! Yum! Your son Curt really loves to make great food, and making the most delicious Angus burger your way...I would love that too...simple, creative and amazing burger the way I would like it! Happy Birthday, my dear friend...looks like you have a great fun trip planned! I'd give my right arm for some maple bacon! Looks like great burgers and Curt's a cutie! Boy would this burger please my husband! It's on my list for our next BBQ.